had we not been trying our best to avoid the cemetery, we’d never have found it. the rain had been heavy, it was never quite gone the entire day. aj and i set out to walk around seven in the evening, light was falling fast. the traffic was thick and noisy along queensway, the first left from my place. 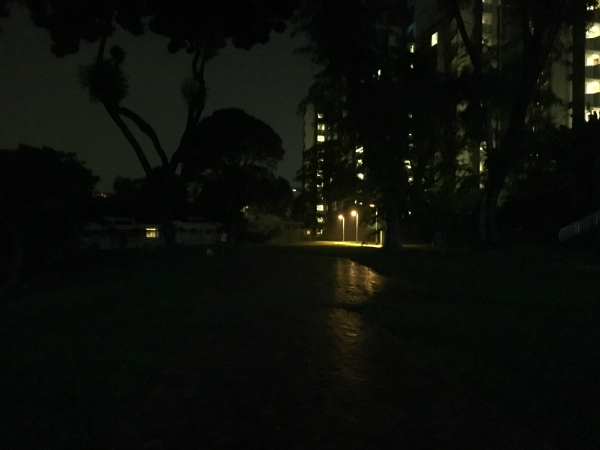 to avoid it, we crossed the road, walked a little along commonwealth avenue, then took an unfamiliar path going in the direction of holland village. aj had just spotted a school, and was a little trippy. it was “ij”; as a young lad he’d dreamt of dating an ij girl. that was the thing to do, and he’d been lucky, he laughed, his wife was from that very school. i rolled my eyes; of course, i have heard this story before. his wife is lovely, so maybe he is right about those ij girls. 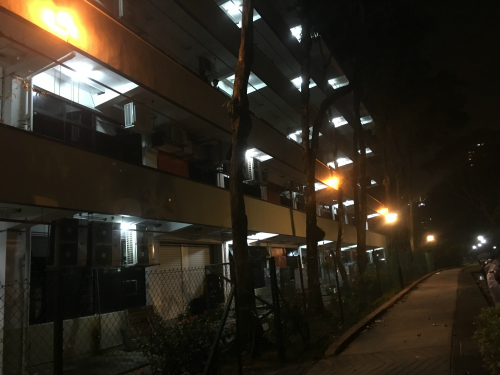 we walked into the estate lying between queensway and commonwealth avenue, the two major thoroughfares. simpler, smaller roads within. past a bank of buildings that looked like offices, we reached an automobile shop. looked like a second hand car store. we stopped dead in our tracks. the cemetery lay beyond that. we’d seen it on our very first walk almost two years ago. 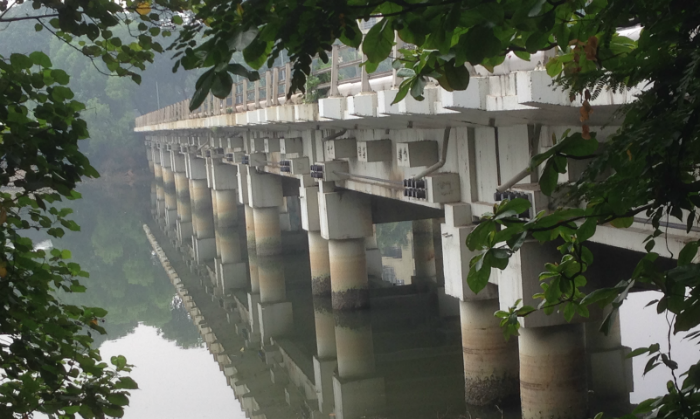 it was after that walk, i decided it might be nice to visit different places in singapore and write about it. 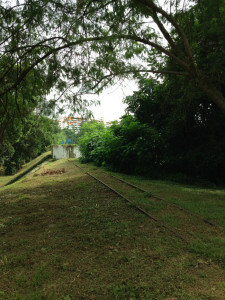 a friend had mentioned there was an old chinese cemetery right in the middle of an hdb estate near holland village. on that day, i remember even in broad daylight i had walked faster by it. we swiveled around and took a left, then up a set of steps on a grass verge. aj started telling me the story of a haunted building where his father managed security after retiring from his job at psa, the massive port operator. 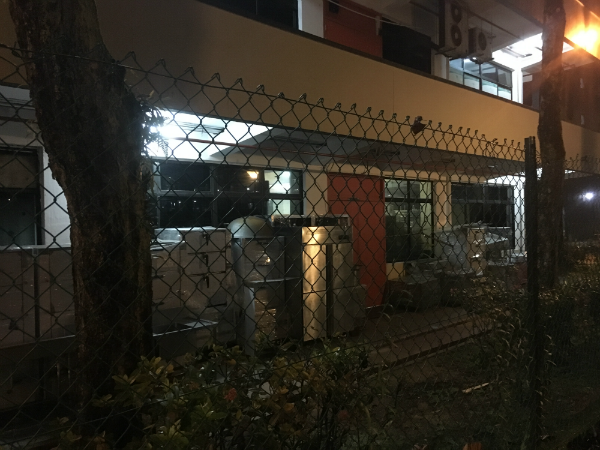 while i wished he wouldn’t talk about scary women in white with long white hair who appeared at midnight, i stayed focussed on not making an error of judgment and landing up via rigmarole of large clunky buildings, hdb blocks, alleys and stairs in that same cemetery. we reached a brick path. on the left, it disappeared into… no idea what. we veered right. and it was just as we came up to the end of the path, a multi-storey building by it, lights still on, people working… that i saw the pillar with the legend and stopped, a strange elation in me. a picture flashed in my mind. office. i’d just got my first job in singapore. i had to write copy for an ad, the client was jtc, jurong town council. and i heard of flatted factories for the very first time. how did you flat factories? factories were huge noisy places with rusty metal and grey men, lots of clanging and whirring; grime, sweat, smoke. jtc made and managed these curious things. bland looking buildings that had ramps and high ceilings, and everything else you needed to set up units to manufacture certain things: tiers of factory space: clean and neat and orderly, maybe a bit grey: nothing like the factories and workshops i’d seen. 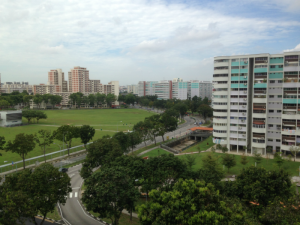 jurong, i heard, was once a swamp with jungles and crocodiles. now it was an industrial area. lots of factories, flatted and otherwise. i knew coca-cola had its plant there, my husband’s office was in the complex. things i’d find out about jtc and its factories and industrial parks as i worked, used to always strike me as unusual. they started telling me i was living in a place with an intriguing attitude, a different mind. that feeling has only grown over the years. 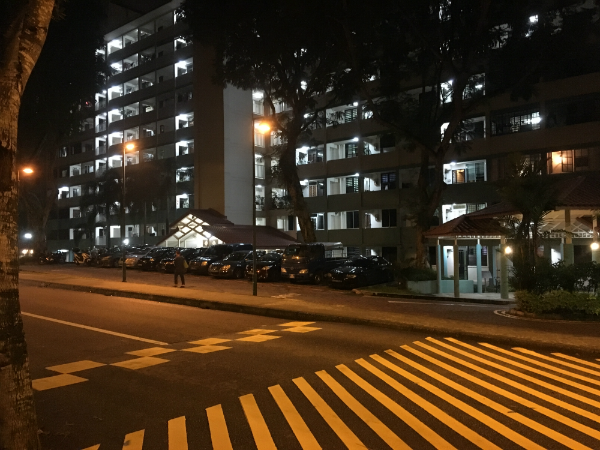 now if i tell anyone in singapore that it was jurong that made me think the city was a cool sort of place, they’d ask if i were “siao”, mad. there are fabulous buildings and “districts” here: state of the art, world class… orchard road (with my favourite takashimaya), biopolis, even good old shenton way, and now marina bay, mediapolis. jurong? honestly, flatted factories are not great looking. 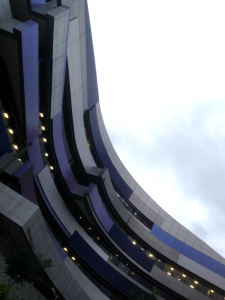 they are just plain buildings with long corridors and a blank sort of stare. yet in them lie hints of a newly independent city state’s ambition, drive, and methodical planning to survive no matter what the odds. in the sixties, small industrial ventures in metal, shoe making, clothes manufacturing, etc., employed up to 40% of the work force, (you can read about it here). 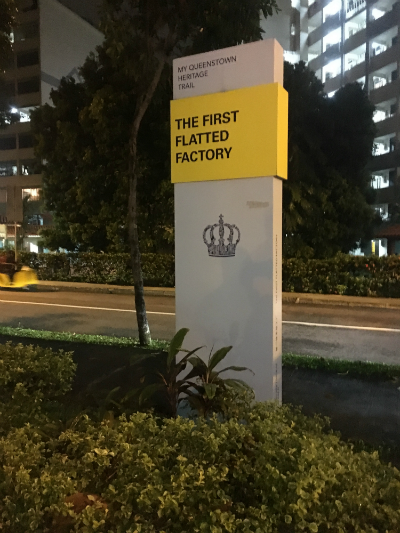 flatted factories, an idea possibly borrowed from hong kong, were set up to provide an organised work space for such enterprises. these were economically viable and probably safer than the older set ups: i have read of the fires that would break out often at collyer quay shops and other estates in the thirties and later. initially, the factories were built close to housing estates, convenient for both employers and employees. our cemetery dodging had brought us right in front of the very first of these factories. at 115 commonwealth drive. the writing was clear and bold on the pillar. why the crown, i wondered. 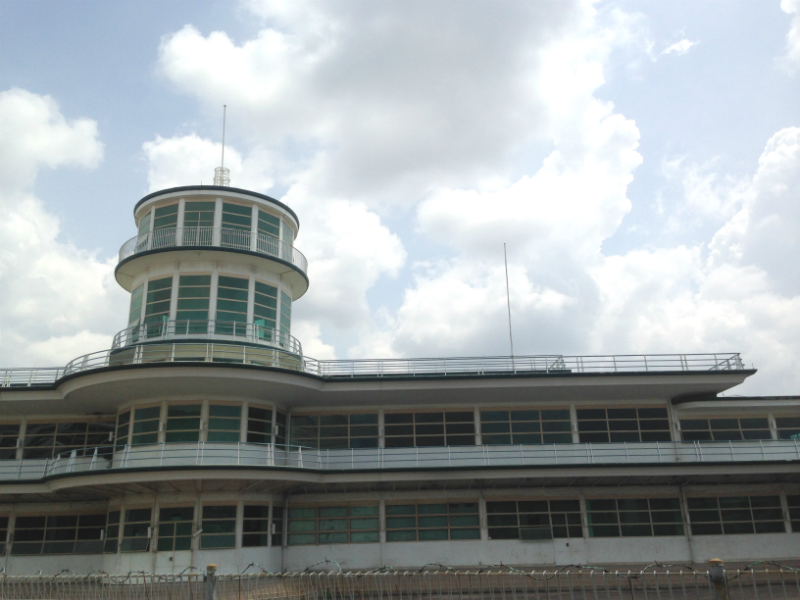 the groundbreaking ceremony of the five-storey factory took place on 30 may 1965, just a few months before singapore became an independent country. 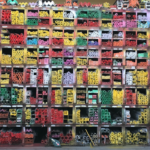 i peered at the building, there was metal office furniture from a factory on the ground floor stacked against a wall outside. workers in maroon uniform stood around chatting. 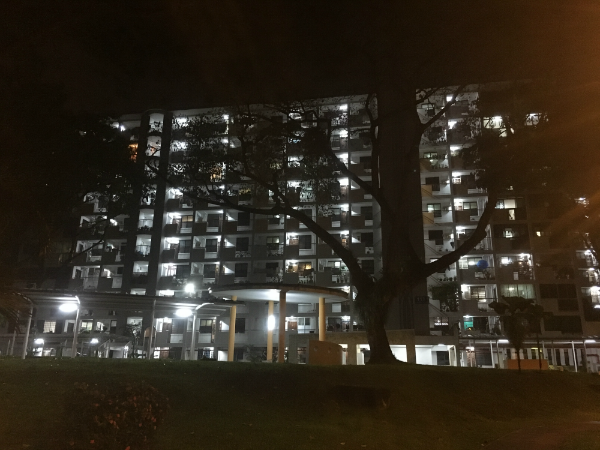 across the road and all around were hdb blocks. 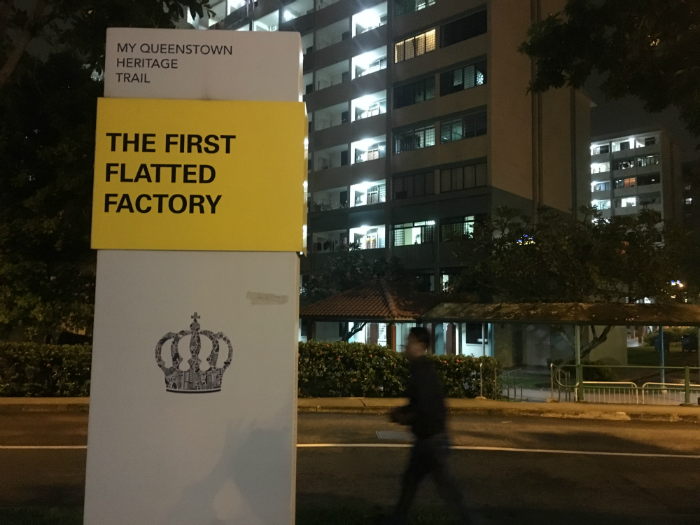 the excitement at finding the first flatted factory ever built here lingered as we made our way down the road trying to reach holland village through the alleys between the blocks. another set of buildings. 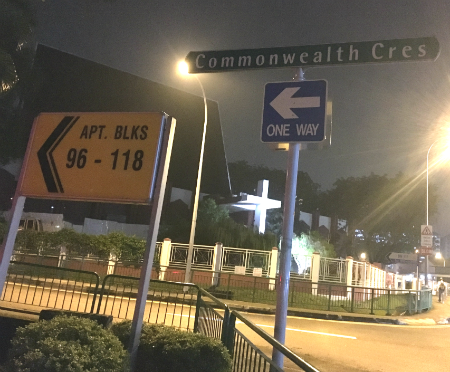 commonwealth crescent. 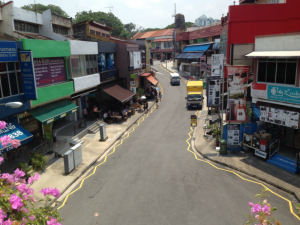 it was right here, i remembered, almost fifteen years ago we’d spent a whole day shooting a fatal accident for the traffic police’s anti-drink drive campaign; there had been a lot of red paint; the food at the hawker centre opposite had been good. we asked a gaunt looking gentleman, which way to holland village. he pointed in a direction. the path got dark and darker. someone walked by, no she didn’t have long white hair, she had a little dog. we were at a narrow, very narrow, staircase without banister. aj was delighted, this was the way to an old client’s house. my feet were unsteady as i went down the steps, the night was eerie all around. 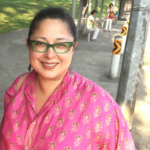 end of 1997, we moved to singapore from india. in 2015, the country celebrated fifty years of independence. 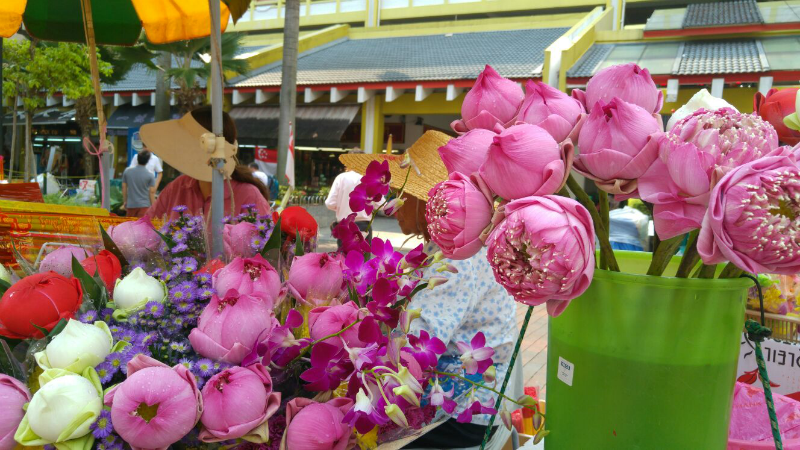 singapore has given me much and i am fascinated by the spirit of this gutsy city state with hardly any land or resources, but oh what dreams and chutzpah (the finest interpretation of the word), the ability to reach big, hunker down and hold and strategise and act and grow. despite my many years here, i haven’t seen a lot of the island, which started out at only 28 miles by 18. now of course it’s bigger, thanks to that spirit i spoke of. so i thought why not see singapore in this landmark year, and celebrate #sg50. aj, my friend and trainer, and i traipse in different parts of the city every week. hope you enjoy the walk talk. you’ll find more in my index. 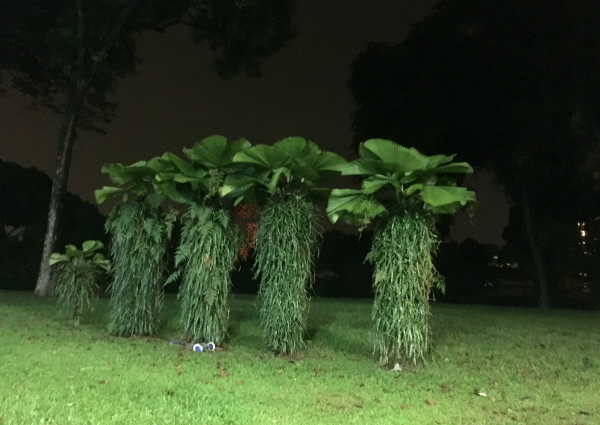 and the walks continue in singapore’s year 51.
just before the dark pathway to the narrow steps, a huddle of palms looking silently on.